Wingless “Angels” hang from an infinitely blue firmament, their nubile bodies twist and crouch in mid-turn on the edges of precipitously steep concrete bowls so as to embody yet another facet of the mythological space of light and air that defines the Southern California aesthetic. Adolescent males dominate “Angels: Street. Skate. Seventies”, a show of Hugh Holland’s photographs that was the product of his now long ago encounter with an emerging counterculture of skateboarders. 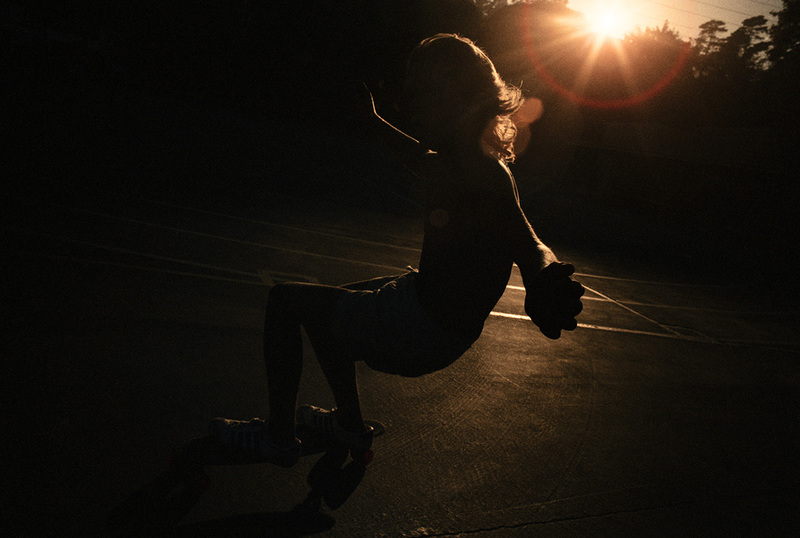 It is both documentation of an homage to the participants of skateboarding and a nod to a moment in time. The 29 color photographs, 20 of which are printed at 20 x 30 inches and nine of which measure 11 x 14 inches, were taken over a three year period, an era since labeled the “Second Generation” in skateboarding history. In 1970, the urethane wheel and the use of fiberglass and aluminum in the fabrication of the skateboard brought about greater ease in handling; and it was also the decade of “the drought”, and swimming pools all over Southern California were drained to save water, creating huge, empty concrete arenas. Concentrating on the actors rather than on the sport itself (the raw, rough-and-tumble world traditionally defined by skateboarding is once-removed from these images), Holland, who had spent a year in Spain during the preceding decade, creates a visual space informed in part by the Spanish Baroque. The result is a world of quasitonodos in which “angels” seemingly fill the circular spaces, hanging from the heights of a light-filled world. In “Asphalt Angel” (1978), a long, lithe body with flowing blond hair extends through the length of its shadow beyond itself against the light, and is suspended for an eternal moment over a curving dome. The curvilinear lines defining the space of the image defy the rectangular format of the photo itself. In contrast, “Reach Out” (1978), becomes an interplay of rectilinear lines, the space defined by two joined walls, while the ‘boarder’s figure defies gravity, the skateboard hanging on a railing that cuts across the sky. The figure’s shadow emphasizes the light, simultaneously creating a spirit-companion to the principal “angel”. In “On the Rocks” (1978), a figure floats across the rounded white space of the concrete arena, as if in combat with the powers of the cosmos. Over this three year period, Holland became thoroughly acquainted with the groups, moving along with them toward the flatlands, to Santa Monica, Venice and the Westside schoolyards of Kenter Canyon, Paul Revere and Brentwood Schools. 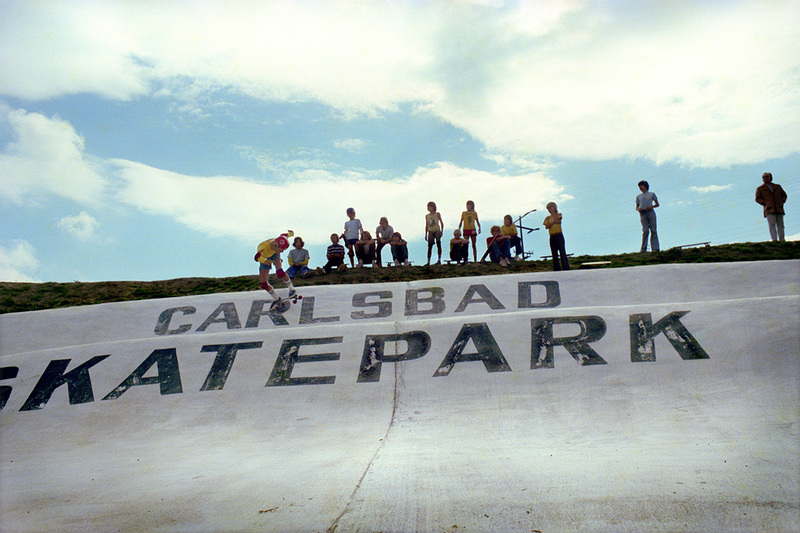 In the empty swimming pools he photographed the “freestyle” of the flatlands, the “vertical” style of the canyon kids and the future heroes of the pools, Stacy Peralta and Jay Adams. “Stacy Peralta in the Valley” (1977) is a composition of lines and shadow, with the ‘boarder flying/floating over a white concrete barrier, against a background of triangular shapes, buildings bordering his paradise. In studies preceding this series, “Gilded ‘boarder, San Diego” (1975), “Boarder School, Orange County” (1976), “Number 79, Long Beach” (1975), and South Bay Gang” (1975), Holland focused on documenting the daily activities and social interactions of the ‘boarders. What breaks loose in the series, commencing in 1978, is something more: another testimony, couched in classical frame, to the physical presence of the body and its image caught in a timeless moment. Posted in Essays and tagged 1970-1980, Hugh Holland, Los Angeles, Skate Culture, Youth.